Published: June 30, 2015 at 11:41 a.m. Updated: July 1, 2015 at 10:30 a.m.
De'Andre Johnson enrolled at FSU in January and participated in spring practice. 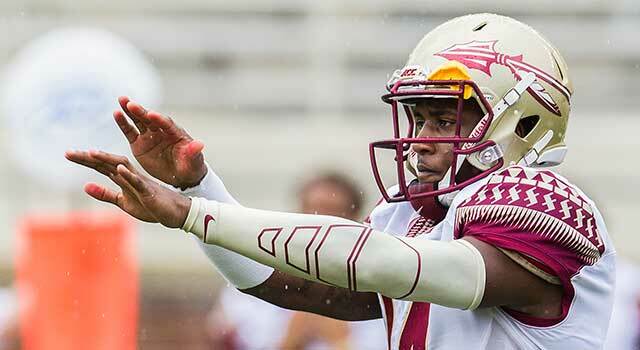 Florida State true freshman quarterback De'Andre Johnson, who was suspended indefinitely last week after he was accused of punching a woman in a bar in Tallahassee, Fla., is the subject of a notice-to-appear warrant. Johnson is accused of misdemeanor battery. Johnson is alleged to have punched a 21-year-old woman in the face at a Tallahassee bar on June 24 and the incident was captured by security cameras inside the bar. A warrant for Johnson's arrest was initially released to the media, but it was later changed to a notice-to-appear warrant, according to the Florida Times-Union. Authorities say that the victim's story is consistent with what is seen on the video. Johnson, from Jacksonville, enrolled at FSU in January and went through spring practice. But he wasn't expected to play this fall. Notre Dame transfer Everett Golson, a senior, and junior Sean Maguire, who started one game for the Seminoles last season when Jameis Winston was suspended, are the top contenders for the quarterback job, with Golson expected to receive the nod. Johnson (6-foot, 177 pounds) was considered one of the top dozen dual-threat quarterbacks in the 2015 recruiting class.